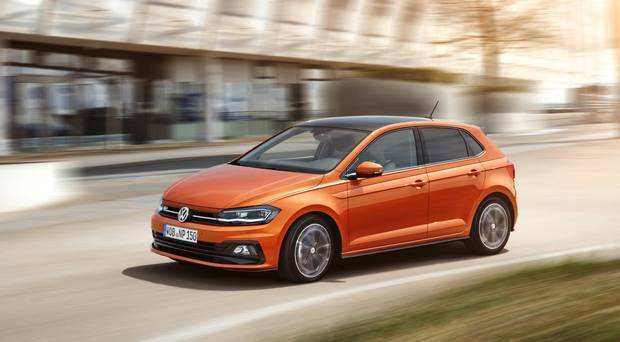 Volkswagen’s new Polo 5dr supermini (no 3dr) goes on sale here on November 17. Expect a “moderate” increase on the current 5dr (from €15,370). Volkswagen will argue that any increase is far outweighed by new technology, a roomier, bigger car and driver assistance systems. Petrols arrive first (four in all) with diesels (two) early in 2018. Engines above 90PS can have a dual clutch gearbox (DSG). A hot GTi version is scheduled to arrive in March. As the car has grown, so has cabin and boot space (from 280 to 351 litres). It is the first Volkswagen/VW Group car with the new-gen Active Info Display – the latest infotainment system has 6.5in to 8.0in displays. You can pick from 14 exterior colours, 12 wheel sizes/styles, several dashpad décors and 11 different seat covers. The off-beat ‘Beats’ version is not coming. R-Line trim will likely be an option pack. More than 14 million people worldwide have bought a Polo from new. This is the sixth generation. They’ve upped spec levels: entry-level trim (Trendline) has LED daytime running lights, speed limiter and Front Assist monitor with City Emergency Braking and Pedestrian Monitoring. Adaptive cruise control (ACC) and semi-auto Park Assist system are options .